Parents must trust that both their vehicle and the child safety seats that they purchase will provide suitable protection in the event of an accident. Unfortunately, if a vehicle is involved in a rollover accident, if the roof is not adequately designed, or if a car seat fails, a child can be seriously injured. If a child strikes the roof of a vehicle during a rollover, the potential risk for serious injury is exponentially greater if a car seat fails. If you or someone you know has a child who was injured in a rollover accident due to a faulty car seat or vehicle, you may be able to seek financial compensation through a civil lawsuit. Contact the experienced SUV rollover lawyers of the Willis Law Firm by calling 800-883-9858 today to discuss your legal options. These injuries are likely to produce a host of severe and ongoing concerns. Initial medical care is likely to cost tens of thousands of dollars or more, and prolonged therapy may be necessary. A successful legal action can ensure that a family has the resources that it needs to contend with these concerns. 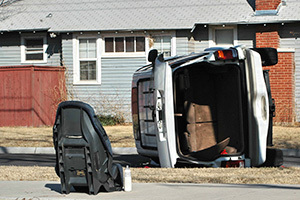 If your SUV rolled over and your child’s car seat failed, causing your child to be injured by your vehicle’s roof, contact the experienced SUV rollover lawyers of the Willis Law Firm by calling 800-883-9858.